Once your new grass – whether grown from seed or turf – has reached a height of 5 cm (2 in) it can be cut lightly with a mower to reduce it to 2.5 cm (1 in). This first cut should be made when the grass is perfectly dry, and the clippings should be collected in the mower’s grass box, or gently raked off the new lawn with a spring-tined rake. There is a wide selection of mowers available with either cylinder or rotary blades. Most mowers today are powered (either by petrol or electricity) and there are powered machines suitable even for very small lawns, so that grass cutting is no more arduous than vacuum-cleaning a carpet. Your best plan is to choose a mower which picks up the clippings, as clippings left on the lawn are bad for the health of the grass as well as being a nuisance when they are blown on to paths and flower beds and carried by feet into the home. Those much-admired stripes on lawns are produced by mowers with rear rollers, which also allow you to cut right up to lawn edges. Rotary mowers give best results with less-than-perfect grass. They are also ideal in areas of high rainfall where the grass often has to be cut while it is wet. 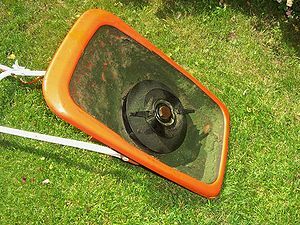 Some are useful too on lawns on steep slopes and for cutting grass under and around shrubs and trees. However, for the finest possible finish on ornamental lawns, the ‘old-fashioned’ cylinder mower is still the best choice. sses in the turf. Never allow the grass to get so long before cutting that you are left with an unpleasant yellow and white patchwork appearance once the lawn is mown. Mow at least once a week between mid-spring and mid-autumn and occasionally in mild winters if the grass shows signs of growth. Always vary the direction of mowing over the course of the year so that you catch the blades of grass from differing angles and get the smoothest finish. Most lawns should never be cut any shorter than 2cm (fin), as a shaved finish, unless expertly done and the grass watered and fed regularly, will inevitably lead to an unattractive, brown patched lawn for much of the summer. The greatest enemies of these machines are small stones kicked on to the grass from neighbouring paths or beds. A stone caught between the knife cylinder and sole-plate may do serious damage. So before a lawn is cut it is advisable to examine or sweep its edges. To do its work properly a mower must be kept well lubricated and well adjusted. The parts that need oiling at least once every time the machine is used are the bearings in which the knife-cylinder revolves, and the chain, if the cylinder is chain-driven. The upper half of each bearing has hole in it for the introduction of oil. Since these two holes quickly become blocked if left open, the_8y should be provided with removable wooden plugs. Gear wheels should be kept well greased and the oil-can be applied occasionally to the roller or side-wheel bearings, ratchets, and other places at which there is friction. The life of machine will be much prolonged if the oil-can is used liberally. To cut easily and cleanly, the cylinder-knives must touch the sole-plate lightly all along. Each cylinder bearing is provided with an adjusting screw above and below it; or a screw above and powerful spring below. With the twin-screw arrangement, the bottom one of pair must be slacked back as the top screw is turned forward, and vice versa. Adjustment must be carried out in very small stages at both ends alternately, until a blade of grass introduced at any point is cut through cleanly. It is impossible to get good adjustment if the bearings are worn. For if the bearings are so set as to prevent separation of cylinder and sole-plate by the grass, the whole weight of the cylinder will be on the sole-plate when no grass intervenes; and on the other hand, if the adjustment prevents the knives rubbing hard, the grass will push them away from the sole-plate. Slack in the vertical – and more im-portant – direction can be eliminated by removing the upper brasses of the bearings and rubbing them on fine emery cloth supported by a hard and perfectly flat surface until enough metal has been removed for the brasses just not to pinch the spindle when screwed up. Repeated tests should prevent the process being carried too far. If, however, pinching should occur, a thickness or two of paper must be inserted between the two halves of a bearing. When knives and sole-plate become blunt, the machine should be sent to the makers or to a local ironmonger who undertakes re-sharpening. This operation can be done properly only with a special grinding equipment, and to attempt it at home is only a waste of time. Wherever possible, vary the direction of cutting. If mowing is done, say, north and south one week, do it east a ad west the next week. When grass has grown unduly lon, set the knives high for the first cut, and go over the grass a second time with them set low. If the knives become clogged, back the machine a foot or two and depress the handle while the mower is pushed smartly forward to free them. In damp weather free the rollers of any mud before putting the machine away. 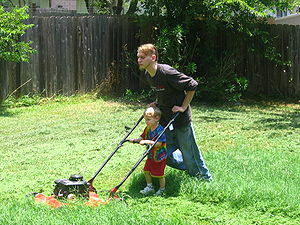 Early spring Scarify the grass with a spring-tined lawn rake, and cut the lawn when necessary. Mid-spring Apply a lawn fertilizer and increase the frequency of grass cutting. Late spring Inspect for weeds and apply a weedkiller if necessary. Summer Cut the grass at least once a week and water if necessary in the evenings. Persistent weeds such as yarrow may need a second application of weedkiller. Early autumn Take appropriate action to remove wormcasts and worms if necessary. Use a suitable autumn lawn fertilizer and reduce the frequency of mowing. Mid-autumn Scarify the grass with a spring-tined lawn rake. Spike all over with a fork and spread a top dressing. Late autumn Remove all fallen leaves. Early winter Keep off the grass if it is wet or frozen. Following a mild autumn you may have to give it a final cut of the year. Mid-winter Rake up the last of the previous autumn’s leaves. Late winter Put down dry peat and sweep away worm casts. If the lawn gets considerable use in the summer, the soil may have become compacted with the give-away sign of moss starting to flourish. The cure is to spike the lawn all over to a depth of 10 cm (4 in) with a garden fork. Then after spiking, improve the texture of the soil by applying a top dressing of peat, soil and sand. However, do not apply the dressing so thickly that it smothers the grass. Feeding normally helps to avoid most lawn problems, but occasionally after a very wet winter or exceptionally dry summer moss can invade the lawn. You can either remove this by repeated raking and feeding, or you can kill the moss with a fertilizer containing sulphate of iron. But the cheapest way of killing moss is to use a special moss killer, watered on to the lawn. Should your lawn develop uneven bumps – perhaps it is a lawn which you have just taken over – the answer is to lift the turf and to remove some of the soil from underneath. Conversely, hollows can be filled by lifting the turf and adding soil. Never roll a lawn. Rolling may be fine for bowling greens and cricket pitches, but it has no place in the garden. A crumbling lawn edge can be repaired in autumn by lifting a square of turf at the lawn edge and reversing it so that the broken edge is towards the centre of the lawn. Worms in lawns produce unsightly casts on the lawn in autumn and winter. The usual way of dealing with this problem is to scatter some dry peat on the lawn and then to brush this off together with the worm casts. In some areas moles can cause havoc on lawns in their search for worms. So you have a simple choice: either you kill the moles or use a proprietary wormkiller to remove the moles’ source of food and also, incidentally, get rid of the wormcasts. The snag with this latter solution is that worms aerate the soil. So their removal inevitably means more work for the gardener in spiking the turf. Weeds are the greatest problem with lawns. Selective weedkillers, either allied to fertilizers, or separately in liquid form (the cheapest and most effective method), will kill all lawn weeds when applied as instructed by the manufacturers. Weedkillers are most effective during showery weather between late spring and early autumn while the weeds are growing strongly. However they must not be used on lawns less than a year old. Similarly the clippings from a lawn treated with weedkiller must be composted for at least six months before they can be used as part of the compost. The alternative is to burn them.